1. Preheat the oven to 140°C/fan 120°C/275°F/gas mark 1 and line two baking trays with baking parchment. 2. Place the egg whites in a very clean grease-free bowl and use a food mixer with a whisk attachment, or a large bowl and a hand-held electric whisk. Start by whisking on a low speed, adding the cream of tartar when it becomes foamy. Next, increase the speed until the egg whites form peaks. Begin to add the caster sugar a large spoonful at a time, whisking constantly; the mixture will become stiff, glossy and firm. Using a large metal spoon, fold in the icing sugar in a couple of stages. 3. Arrange your selection of secrets – sweeties, chocolates or dried fruit and nuts – on the trays. Place about 10 groups on each tray, spaced fairly well apart. 4. Open the piping bag so it is turned inside out and, using the paintbrushes, paint three or four lengths of neat (not diluted with water) food colour paste, running from the nozzle and stopping within a few inches of the top. You can paint with one or two contrasting colours if you like. 5. 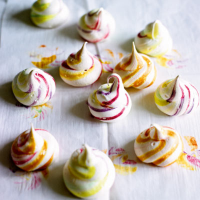 Now carefully spoon the meringue into the bag and pipe on top of each secret. Bake in the preheated oven for 40–45 minutes until crisp on the outside but still soft in the middle. Cool on the trays. These will keep in an airtight container for a few days.